Singapore Airlines promotion code 2018 – 20% discount all flights! Thanks to China Airlines promotion (however operated by Air France) we have great solution for those of you preferring direct service rather than the cheapest option available. For limited travel dates in September and October you can book cheap non-stop flights from Paris to Taipei in Taiwan alreay for €412. This is for a round trip including all taxes and checked luggage. Want to book greatly discounted Air France flights and fly on board of this SkyTeam carrier for less do not miss this special promotion..very limited availability thought..
China Airlines / Air France promotion is available when departing from Paris to Taipei in November and beginning of December 2018 or January 2019. Max stay 1 month. Discount is available till end of July or until the cheapest flights last. Below you can refer to our booking and most of the travel samples available. (Outbound date, you can chance your inbound flight from Taiwan to Europe based on above conditions). Booking sample of China Airlines and Air France promotional deal from France to Taiwan below. 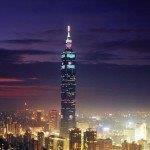 During this special sale you can book discounted cheap non-stop flights from Paris to Taipei, Taiwan from €412! As per our booking sample you would depart to China on 10th of November and return from Asia to Europe on Sunday, 25th of November 2018.